The Aral Sea, located between Kazakhstan and Uzbekistan, is diminishing in size. Students must analyze and interpret the background information, photos, images and data provided in order to determine the causes of the size change as well as the effects on habitat, resources and people in the area. Student recommendations for managing and stabilizing the Aral Sea are presented in a final report. The URL opens to the investigation directory, with links to teacher and student materials, lesson extensions, resources, teaching tips, and assessment strategies. 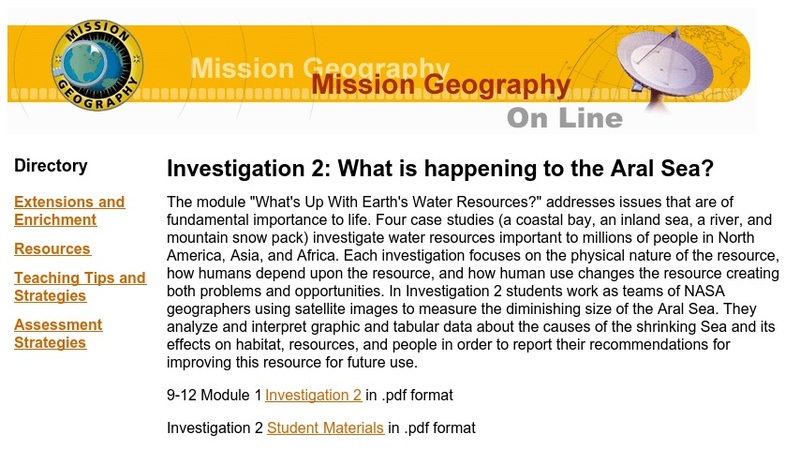 This is Investigation 2 of four found in the Grades 9-12 Module 1 of Mission Geography. The Mission Geography curriculum integrates data and images from NASA missions with the National Geography Standards. Each of the four investigations in Module 1, while related, can be done independently.